If you do not correct the problem now, you are one second from disaster. When you get a puppy, you have a unique opportunity to raise it properly right from the start. But always keep in mind that even the sweetest puppy will try to growl, snap, mouth or somehow dominate the owner. How the owner reacts to these events will be the biggest deciding factor in whether or not the puppy grows to become a safe companion or an aggressive liability. Remember that what may be cute today, as a puppy, will not be cute tomorrow, as an adult dog. Fortunately, early signs of aggression in a puppy can be easily cured. Unfortunately, signs of aggression in an older dog are very difficult to treat and there will be no guarantee to any dog owner, of any breed, that their mature dog will not bite. Many dogs today are being euthanized for aggressive behavior. In many of these cases, the aggression was allowed to start as a puppy and escalate through adulthood. Because many owners neglect to identify and correct early signs of aggression, more and more dogs are paying the price in the form of a death sentence for being too great of a risk to society. The absence of leadership is the biggest cause of all behavior problems in dogs, especially aggression. The presence of a strong and confident leader can soothe a dominant dog and raise the confidence of an insecure dog. Every professional dog trainer and animal behaviorist will first recommend establishing a solid leadership role in the dogs' life before anything else. It can not be said enough, that even a dog with good genetics and proper socialization can turn aggressive or develop behavioral issues if there is a lack of human leadership in the household. Leadership can be established through proper obedience training. 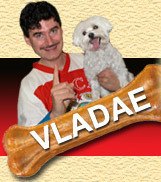 I strongly recommend using my award winning, dog training program, "Obedience for Life," (www.911dogwizard.com) to establish human authority and leadership for your dog. Unconsciously and / or naively, some people select certain breeds that are famous for their guarding or fighting ability. Some people are also getting dogs from incompetent breeders whose breeding stock have a history of biting. These dogs are born to be aggressive! Certain breeds need special management and socialization. These dogs should be owned by someone who is determined to properly manage and socialize at an early age and continue throughout the dogs' life. Positive and constant socialization with people should start after the first few weeks of life and be continued throughout adulthood. Special attention needs to be paid to the two critical stages of puppy development. The two critical stages are: 4 to 8 weeks - socialization with other dogs / litter mates and 8 to 12 weeks - socialization with humans. Make sure the puppy is desensitized to the following: touching its ears, paws, upper part of the neck, and teeth. Make this a pleasurable experience by combining touch with a special treat that the puppy only gets for being accepting of this exercise. We like to use American cheese or Russian kielbasa! Also, dogs must be socialized with children, especially if the owners do not have any in their family. Children make sharp, sudden movements which will activate the dogs' natural chasing instinct. These movements may also frighten dogs, especially the insecure, nervous ones. Positive connections between running, chasing and jumping children should be established by giving your dog special treats for calmly accepting the movements and sounds of children. Children will jump, run, scream, hug, grab, and pull. That is what children do best! Please note, that even though positive connections are being established between your dog and your children, NEVER ALLOW YOUR DOG OR PUPPY TO BE LEFT ALONE WITH A CHILD UNSUPERVISED! Some people unknowingly train there dogs to be aggressive. They do this by allowing or encouraging their dog to bark at strangers. People believe this is acceptable behavior because the dog is supposed to guard and protect the family. All too often, acceptance of this behavior by the owner leads to an attack against the neighbor or the postal carrier. Allowing a dog to bark at even one person is perceived by the dog as approval to protect its territory against all people. Dogs are not supposed to bark at strangers walking by and they are not supposed to protect against neighbors and postal carriers. It is my observation that puppies that have not learned self control through proper obedience training and are allowed to bark at strangers, will often growl and bite as mature adults. Barking escalates to biting because eventually the dog feels that growling and barking are no longer effective in keeping certain people away from its territory. Frustration builds over the course of months or even years until finally the dog believes it is necessary to take extreme measures by biting or attacking anyone it perceives as a threat to its family or property. Many dog owners participate in rough games, like tug of war, with their dog. Not understanding that the game must be started, won and stopped by the human and not the dog, they allow their dog to play on its terms. This means that the owners have put themselves in a submissive position while putting their dog in a dominant position. If a dog feels dominance and power over their owner, imagine what they feel against other adults and children! From my experience, working in security and police and special Russian forces, I will go on record and say that playing this game improperly is like playing with fire. Every dog, from a four pound Pomeranian to 100 pound Presa Canario, is looking for weakness in order to show its strength. Once they experience strength, they are not likely to show weakness. You have to discipline a dog, but any human type of discipline will have the opposite affect on a dog. A dog that is hit, kicked, slapped or hanged for misbehavior is experiencing trauma inflicted by man. The dog will become fearful of its owner or other people on the street. A fearful dog is at high risk for biting or attacking any person who it perceives as someone who may inflict pain and trauma. A fearful dog can bite because it is scared of a situation that it does not understand. In most cases, the cause is genetically driven. Insecurity will feed fearfulness. People commonly reinforce this behavior, by instance, when their dog starts growling and they try to soothe the dog by sharing affection instead of communicating to the dog that this behavior is unacceptable. The biggest mistake people make is allowing their dog to bark when the door bell rings. The door bell creates excitement, excitement creates drive, drive creates frustration and frustration creates aggression. The Russian academic, Pavlov, made dogs' salivate when someone rang the bell. So many people are conditioning their dog to become excited and frustrated when the door bell rings. Instead, ACT teaches clients to train their dog to react to the door bell as children react to the sound of the ice-cream truck. Now, instead of an intruder alert, the dog is conditioned to associate the door bell with a positive event. Do you know how attack dogs or police and guard dogs are trained? They are trained by experiencing agitation. With the dog being held back by the handler or behind a fence, the helper (agitator) is moving quickly past the dog, clapping his hands, screaming and knocking the fence. When the dog becomes agitated, the helper runs away. The dog begins to realize that it can make people go away by displaying this type of behavior. Now the dog is motivated to respond this way whenever it feels that someone must leave the premises. Is this not the same procedure that unsupervised children practice when they are teasing a dog and acting inappropriately by barking or throwing things at them? Of course it is! These children are actually duplicating the same steps used by professionals when training a dog to attack. All that frustration developed behind the fence will turn in one quick burst of energy in the form of an attack. This brings us to another point. Dogs should not be restrained on tie outs or kept near a fence line where children or adults can pass by and have the ability to tease them. Many dog owners leave their dog outside for long periods of time without supervision. Often, this is the only means of exercise the dog is getting. Unfortunately, this practice is creating frustration in their dog. Many dogs will begin to bark and charge at people or dogs that are passing by as a means to overcome boredom or release excess energy or frustration. Once again, frustration creates aggression! Exercise, both mentally (in the form of obedience training) and physically, will help to lessen aggressive tendencies in dogs. Remember - a tired dog is a good dog! So many dog owners, members of their families, and visitors are bitten by the family dog because the dog feels that its dominant status is being threatened. It is my experience that in most households, where we deal with aggressive dogs, we are dealing with a dominant type of dog and a submissive type of owner. These dogs are fine unless they are challenged in some way. An example of being challenged is an owner or visitor trying to take away an item that the dog has in its possession. Keep in mind that a dominant dog is the Alpha of the household. All things belong to the Alpha and there are consequences for subordinates who challenge the Alpha by attempting to take something away. These consequences will take the form of a growl, bite or an attack. Remember that this behavior is very understandable to the dog. In nature, the only way for a wolf pack to survive and maintain social order is to regard one dog as the Alpha / leader. This dog makes all the decisions and takes ownership of all things. This is the dog that is most qualified for the position of leadership. In the human household, the human is most qualified for this position and therefore must never allow the dog to posses the Alpha role. There are many signs of dominance and dominance related aggression. Some of these include: growling when moved from a favorable position, refusal to comply with the 'down' command, growling when the owner passes the lying dogs' space, biting when being pet on the top of the head, growling when the owner approaches food, growling when wiping paws or petting or touching the scruff of the neck. It is my observation that many of these dogs are allowed to elevate their social status by sleeping in the owners' bed and resting on their furniture. Many are also free feeders and have not learned self control through proper obedience training. It is important to realize that a dog needs to obey, on first command, even in the time when they would rather being chasing the squirrel, cat or even your neighbor's child. These are real life situations with real life consequences if the dog chooses to disobey the owner. People who own a dog that displays all or some of the above behaviors need to be looking for a qualified dog trainer immediately! This type of dog is a tragedy waiting to happen. People living with this situation are living with a walking, barking time bomb! Please don't let your dog become a safety hazard to you and your neighborhood. Don't be one of those people that believe nothing tragic can happen to them. It can and it will if you continue to ignore the problem! For information on dog bite statistics and advice for dog bite victims, please go to www.dogbitelaw.com. This website is authored by Kenneth Phillips, who is referred to as the leading expert on dog bite law. He has great products on his website that can assist you with dog bites and dog bite law. Follow this link to be directed to the product page. http://www.dogbitelaw.com/store/index.php. This website is a must see for anyone who owns a dog!